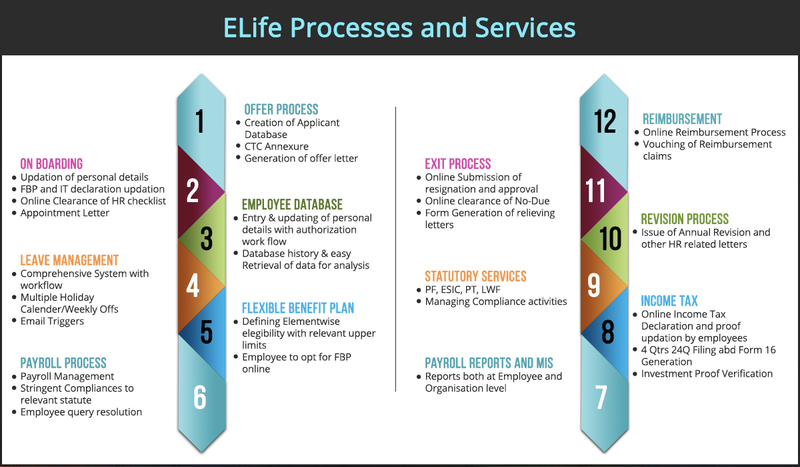 ELife is offered as an outsourced solution “on the cloud” for payroll and beyond…..
ELife is a comprehensive service addressing the total process of an Employee’s life cycle in an organization from Offer Letter to Exit, incorporating powerful analytics, pro-active alerts and best practices. Our rich experience in the HR domain and Cloud Consulting have helped us create a Cloud solution that is secure, easy-to-use and highly effective. Move from excel to web-based processing of payroll etc. We, at ePeople, understand that your business is about you; and hence you need answers and strategies that are built around your business needs and tailored to suit your working environment. ePeople offers bespoke consulting in the human resource, business processes and technology implementation domains. We use technology, people and consulting as enablers to solve a wide range of challenges and empower people to work right and work smart. Easy management of statutory compliance activities.